After a prolonged period of rain last month, the waters of the Seine, Loire and Yonne rivers began to rise alarmingly. In the départements of Loiret and Seine-et-Marne the rivers broke their banks causing what French President, François Holland, described as a “real catastrophe”. In Paris, the Seine didn’t break its banks but, rising to some 6.3 metres above normal on the night of Friday 3rd June, it came dangerously close. The sight of dirty brown water and debris floating through the centre of the city was surreal. Although the Seine didn’t break its banks in the city, the quais on either side of the river were completely flooded giving a clue at least as to what those in the worst affected départements were experiencing. A five-minute walk from my home, the Seine had completely covered an island jutting out into the river. The Parisian green benches, the skateboard park and the honey farm with its beehives were completely submerged. A nearby tennis court was looking the worse for wear. And the péniches (houseboats) had been cast adrift. On Saturday 4th June the news was that although the water hadn’t fallen, at least it had stopped rising and so, with the photograph of the policemen shown at the beginning of this post standing in front of the Viaduc d’Austerlitz in 1910 in mind, I went to the same place to see what I could find. 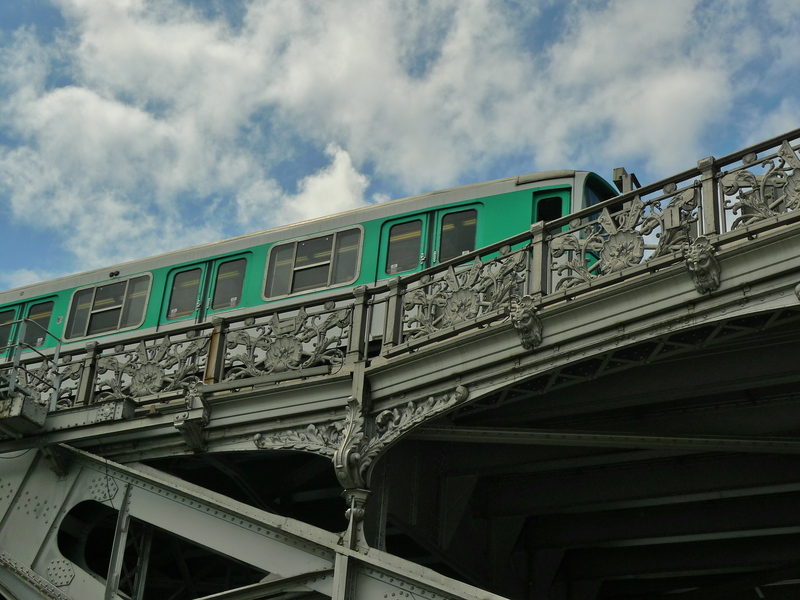 Completed in 1904, the Viaduc d’Austerlitz is a 140-metre single-span bridge built to carry the trains of Métro Line 5 over the Seine from the Quai de la Rapée to the Gare d’Austerlitz and back again. With an 8.5 metre wide deck suspended 11 metres above the river the bridge was designed to make it easily navigable for river traffic. 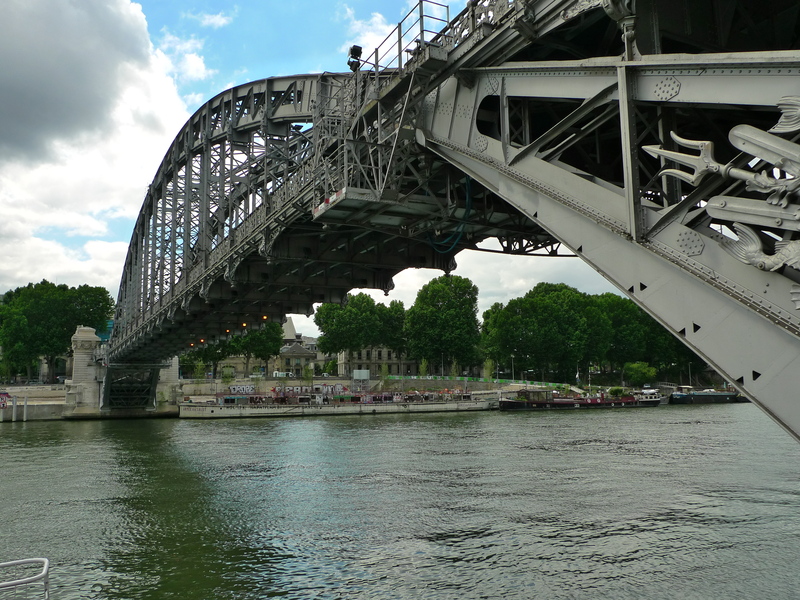 During the recent crisis all river traffic was suspended because the exceptionally high water level made the bridges over the Seine impassable. Underneath the bridge the quay is usually open to pedestrians and vehicular traffic but on Saturday it was flooded despite a hastily erected barrier being in place. What does a flood sound like? Would there be a sound-rich raging torrent of water crashing it’s way through the city? I thought about this as I watched the water rise over several days and I discovered that it didn’t happen like that. There was no raging torrent but instead, an almost silent, inexorable flow of water calmly engulfing everything in its path. On Saturday, with the floodwater passing by me and the trains of Metro Line 5 passing overhead, I recorded the sounds around the Viaduc d’Austerlitz. It wasn’t the sounds of the vast quantity of ugly brown water flowing along the river that caught my attention but rather the more delicate sounds on the flooded quais. With a repetition of the catastrophic Paris flood of 1910 avoided, the floodwater is beginning to recede. Water pumps have been drafted in, the clean-up operation has begun and the cost is being estimated somewhere between €600 million and €2 billion. It’s easy to lament the situation in Paris over the past few days: the flooded quayside bars and restaurants, the péniches cast adrift, the closure of the Louvre and the Musée d’Orsay to move their collections from ground level to higher floors, the occasional power outage and the closure of some Métro stations and part of RER Line ‘C’. But let’s not forget the 4 dead, at least 24 injured and thousands of residents in towns such as Nemours and Montargis who saw their homes submerged and shop owners left counting the cost as the town centres were inundated by the floods. 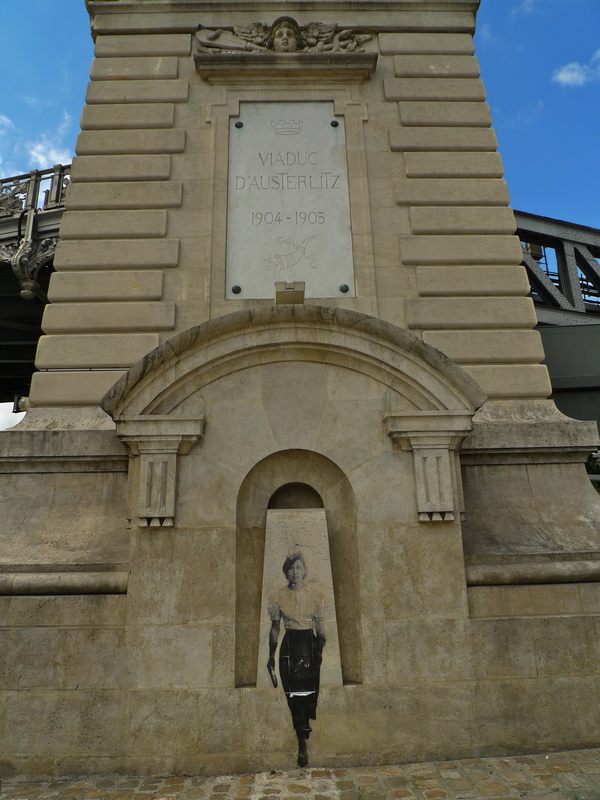 FOR OVER ONE HUNDRED years, the Viaduc d’Austerlitz has swept majestically over la Seine. Its sole purpose is to carry the trains of Métro Line 5 over the river from the Quai de la Rapée to the Gare d’Austerlitz and back again. 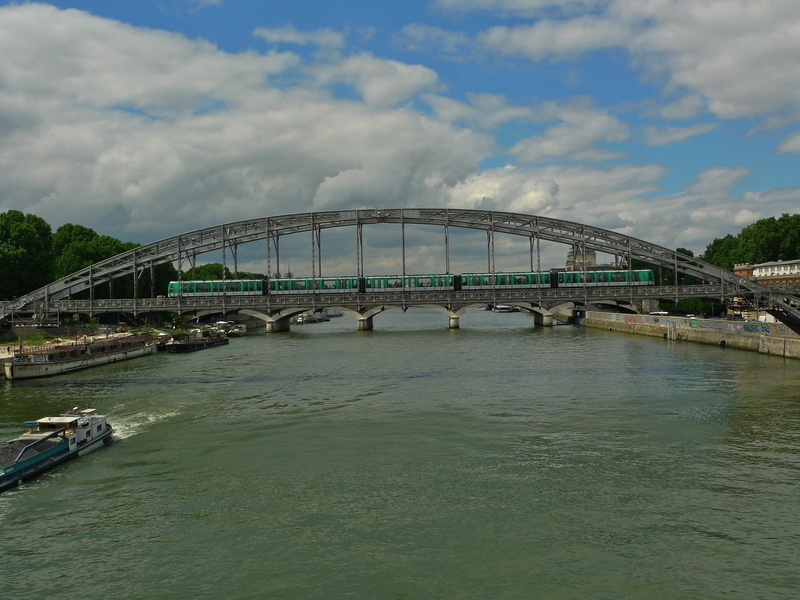 The task facing Fulgence Bienvenüe, the architect of the Paris Métro network, was how to get Line 5 across the la Seine without interfering with the river traffic. The answer came from the engineer, Louis Biette, who proposed a single-span bridge with the deck suspended from two elegant metal arches so that no pillars or supports descended into the river. 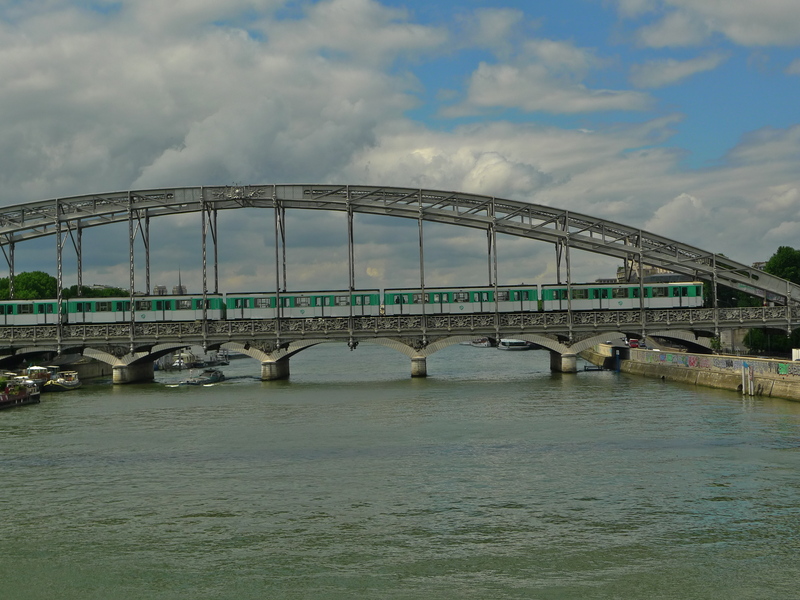 The single-span stretches for 140 metres, which even today makes it the second longest bridge in Paris. The 8.5 metre wide deck is suspended 11 metres above the river. Two stone abutments support the ends of the metal arches, one on each bank of the river, with each measuring 22 metres x 18 metres. Each abutment also extends some 10 metres below the river. The viaduct itself was built between 1903 and 1904 by the Société de Construction de Levallois-Perret which, under a different name, was the same company that built the Eiffel Tower. Building the viaduct itself was relatively straightforward. Large wooden scaffolding was erected with wooden pillars sunk deep into the river bed to enable the prefabricated metal sections to be put into place. Building the approaches to the viaduct, or at least one of them, was much more complex though. While the approach from the Gare d’Austerlitz on the Left Bank posed no particular problems, it was a completely different story on the other side. It was decided that it was impracticable to demolish the necessary buildings on the Right Bank to facilitate a straight entry to the viaduct so instead the design called for a sharp 90° turn within a restricted space. But not only that, the line was required to make a sharp climb from under the Place Mazas to the level of the viaduct. 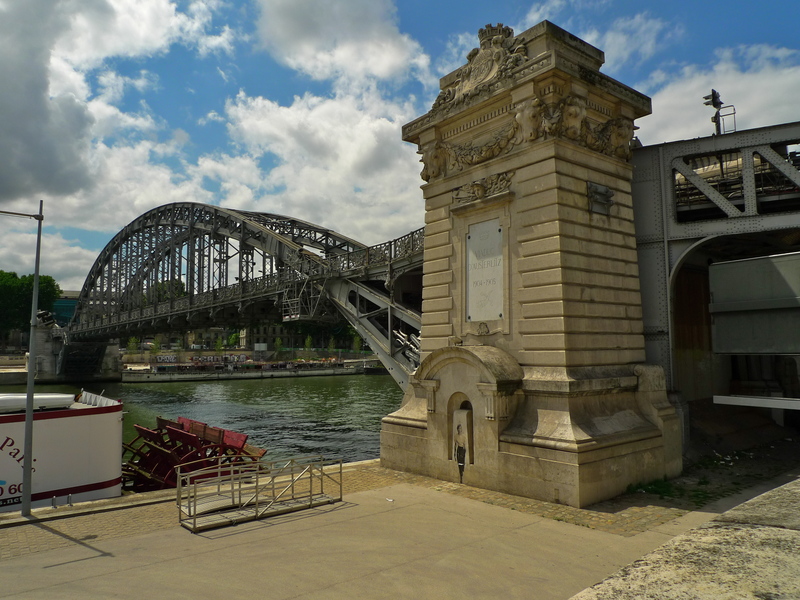 The problem was given to the firm Daydé and Pillé who built the Grand Palais in 1900 but were really specialists in metal construction and particularly bridges. Their solution involved the application of mathematics and the construction of a helicoidal extension to the viaduct. A helicoid I am told is a curve shaped like Archimedes’ screw, but extending infinitely in all directions. This particular helicoid has a radius of 75 metres and a slope of 4% which not only provides a neat solution to the problem but it also makes the ageing MF 67 Métro trains groan with exasperation. 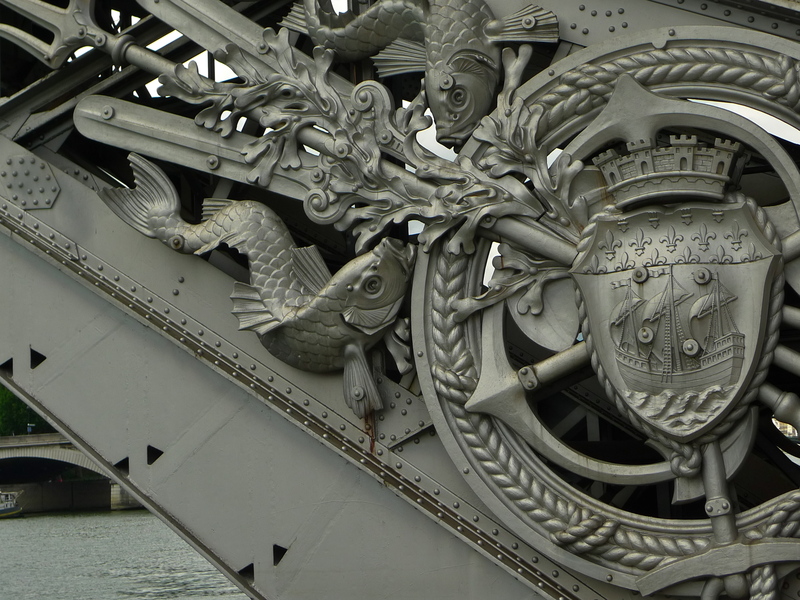 Jean Camille Formigé was responsible for the decorations on the pillars, the arches and the abutments of the viaduct which consist of dolphins, shells, seaweed and animal faces as well as the cast iron designs featuring the coat of arms of Paris attached to anchors. Formigé though was not responsible for this more recent decoration on the abutment on the Left Bank side. Thanks to the foresight of Fulgence Bienvenüe and Louis Biette together with the ingenuity of Daydé and Pillé, Métro Line 5 was successfully navigated across la Seine from Quai de la Rapée to the Gare d’Austerlitz via the Viaduc d’Austerlitz. I find the Viaduc d’Austerlitz not only visually attractive but sonically priceless. Every time I go there I am acutely aware that the screeching of each MF 67 train is a sound that is fast disappearing. The old trains are gradually being replaced by the swanky new, more efficient, cleaner and quieter MF 2000 trains. That’s clearly the right thing to do … but I can’t help feeling sorry that we will lose one of the sounds that defines Paris in the process. It seems appropriate therefore to leave you with the sounds of the short ride from Quai de la Rapée station, under Place Mazas, up the slope and round the helicoidal curve, across the Viaduc d’Austerlitz over la Seine to Gare d’Austerlitz station. It’s a journey of one minute and thirty seconds but it spans over one hundred years of history.